What a relief! You just wrapped up a successful crowdfunding campaign or your day of giving was a smashing success. Well friend, take a moment, celebrate your victories and then get back to work! You have some stewardship to do. Hopefully, as a part of your marketing plan, you thought ahead of time about how you can best steward these donors. Many of them have just made their first gift to you! Stewardship is a key component to transitioning these folks from a one-time donor to a consistent giver. The best kinds of stewardship are intentional, donor-centered, and timely. Make a plan: You should know exactly who you want to thank and how will thank them far before your first donor makes a gift. Prepare: You can design and write and maybe even record all of your stewardship pieces well in advance of when you need to send them. If you are updating on results, the only X factors are your final numbers. Get these pieces done in advance so that the day after, when you are tired (and let’s be honest, maybe a little over it) all that needs to happen is updating a couple numbers or words to reflect your results. Get Social: Many of your donors learned of your efforts through their social media channels and you can thank people right away with social. 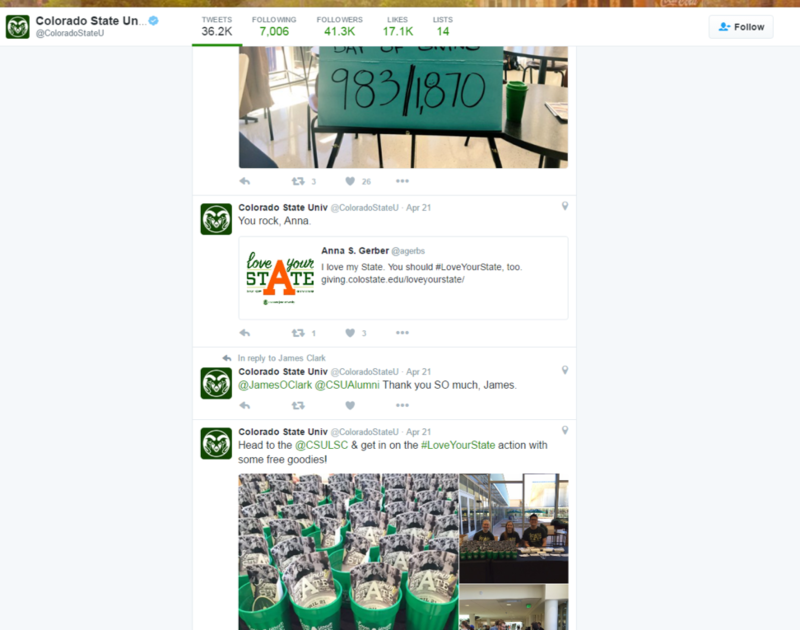 For CSU’s day of giving, if someone tweeted at us that they made a gift, we tweeted a thank you right back at them. Get personal: Lynne Wester, Donor Relations Guru shared two personalized videos from Whitworth and Purdue that she received via twitter for gifts made on their giving days. They are great; one is very personal, the other is a bit more general, and both made her feel special. Think she’ll give again to those universities? I bet she will. Update supporters regularly: Show progress, say thanks, and give some action items for your supporters. Actions can be: share our project/day, give again, recruit other supporters, whatever. Just be sure to let your gratitude shine. Share your success: People want to know they were part of a successful endeavor. Don’t ask them to participate and then leave them hanging about the results. At a very minimum, the day after you wrap up, use social, send an e-mail, communicate as pro-actively as you can that you met your goals and you couldn’t have done it without your donors. One important note about this: Who met the goal? Did you? Or did your donors? Be careful not to use too many “we” statements in your stewardship pieces. Your donors are the ones who did it. Your team worked hard to get them there, but let your donors own the accomplishment. Wrap it Up: Once all your gifts have been processed and you know your final results, share again. Thank again. Send new content, maybe a video with footage from on-campus events that day, or more in-depth impact of the difference their gift is making. Treat ‘em right: I’ve heard of an institution or two (I won’t name names) that pulls their crowdfunding only donors out of other University communications or stewardship efforts. Don’t do that. Treat your crowdfunding donors to all the communications and outreach that you can. They’ll tell you if they hate it. Most will appreciate it. Make sure they hear from you outside of more solicitations. Ask Smarter: Asking is part of the stewardship cycle. What’s lucky for you is you have additional information now. You know more about what your donor cares about and what they want to support. Give them the courtesy of being sure that when you do come back for another gift, you paid attention to what they told you. If you treat donors who give to special projects, be it a crowdfunding campaign or a day of giving right, you increase your odds of getting them back. Stewardship is a key part of any campaign. Don’t forget it when you are making your plans!